I mentioned last week that one of my Top 10 items for fall is a shirt dress- so I thought I’d show you today what I mean! I bought this cute dress this summer at Off 5th. It’s made by Laundry by Shelli Segal. Since I love seeing comparisons, today I’m showing some ‘before’ pictures that I pulled from Pinterest, just to show what in my opinion is not working! Let’s take photo #1- this gorgeous gal looks like she forgot her pants! To me, this shirt is too loose- and it honestly looks like she borrowed it from her boyfriend and called it good. I do love her sandals though! Photo #2- This gal also didn’t add a belt to define her waist, which makes this dress a little too shapeless. While I love purple, something about this color seems a little off to me. I also do not like these shoes with this dress. A heel or strappy sandal would have been better. Linking up with BonBon Rose girls for Monday Mingle! Sept 14th, Oh Yes You Can! 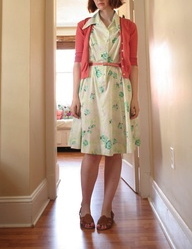 LOVE your blog and love this dress…one thing for me, though (short legs), I would go with a shoe that doesn’t have a strap. After seeing pictures, I have tossed every pair I own that have an ankle strap. Cuts my leg right off! You are exactly right- the ankle strap is creating a visual ‘cut off’ that makes my legs look shorter! I’ll be getting rid of all ankle strap shoes in my closet too! I actually love the vintage librarian vibe of #3, except for the shoes. I think a modern, colourful pair of shoes with a bit of a wedge or heel would take the frumpy edge off of the look. That’s a great shirt dress that you have! It would look super cute with a wedge for fall! Looks great on you. Unfortunately, they don’t have enough structure for me and I’m a little to hippy!